Mural painting has come a long way since its first appearance around 30,000 BC, with the famous paintings in the Chauvet Cave in Ardèche department of southern France. As it progressed into modern times, the term “mural” was often associated with the Mexican “muralista” art movement and the renowned artist Diego Rivera. One of the most esteemed muralists in the United States was Thomas Hart Benton (1889–1975), a painter from Missouri, who was at the forefront of the Regionalist art movement. The artist attracted enormous appeal for his ability to depict everyday people in vivid scenes that represented the character of this country. Thomas Hart Benton (American, 1889-1975) City Activities with Dancehall from America Today, 1930–31. Mural cycle consisting of ten panels. Egg tempera with oil glazing over Permalba on a gesso ground on linen mounted to wood panels with a honeycomb interior. The Metropolitan Museum of Art, Gift of AXA Equitable, 2012. 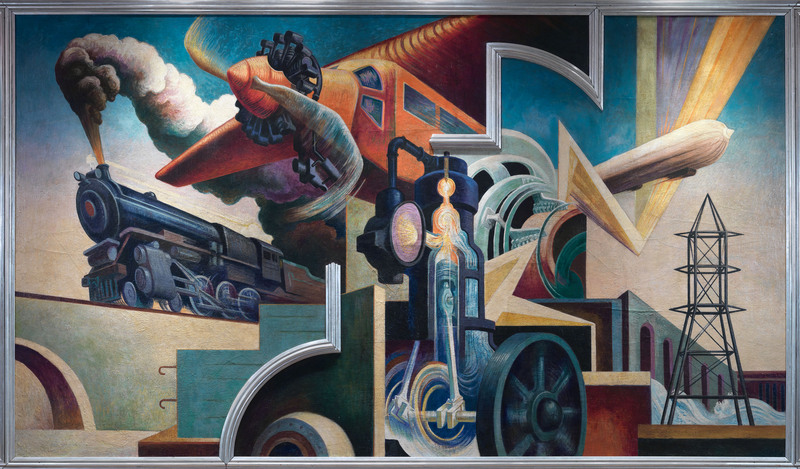 Benton’s epic mural titled “America Today” was considered one of the most remarkable accomplishments in American art of the period in which it was painted. The artwork consists of ten extraordinary panels, and emphasizes Benton’s colorful style and the fluid manner in which he painted figures with a sculptural quality. 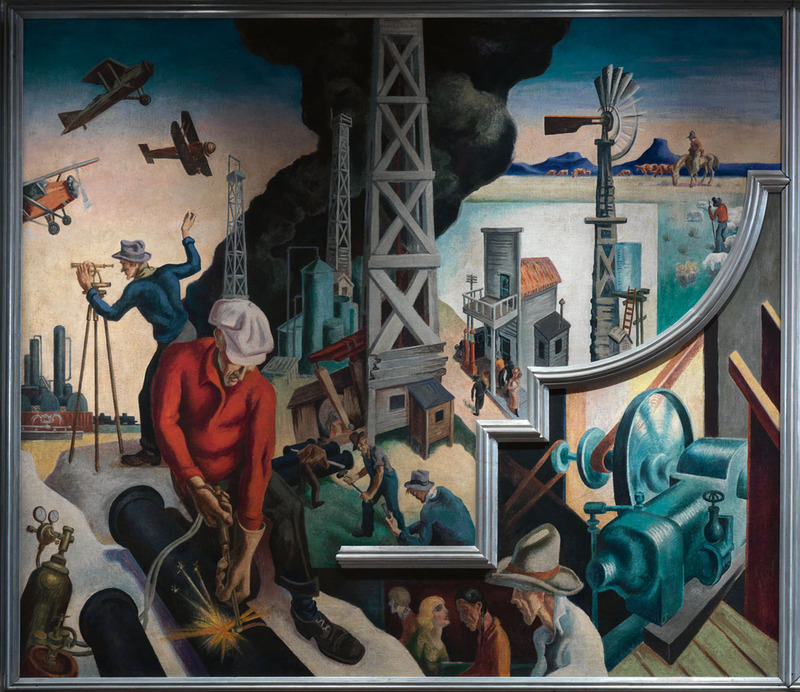 The mural portrays a sweeping panorama of American life during the 1920s. As a slice of life and historical reference, this mural not only exudes the belief in American progress that was characteristic of this period, it also acknowledges the onset of economic distress that would characterize life in the following decade. 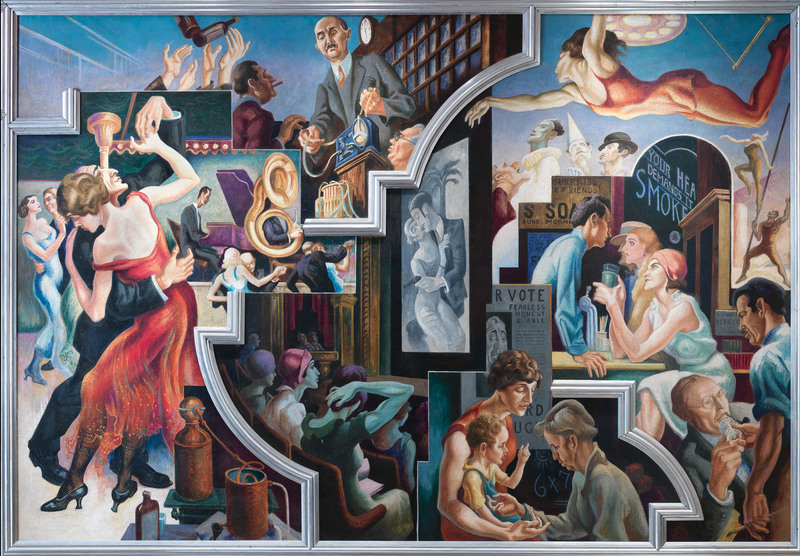 The mural, “America Today,” was originally commissioned in 1930 by the New School of Social Research’s director, Alvin Johnson, who had modeled the school as a center for progressive thought and education of New York City. The mural adorned the boardroom of the school’s International Style modernist building on West 12th Street, in Greenwich Village. Thomas Hart Benton , Instruments of Power, one of the ten panels in the “America Today” mural. Mural cycle consisting of ten panels. Egg tempera with oil glazing over Permalba on a gesso ground on linen mounted to wood panels with a honeycomb interior. The Metropolitan Museum of Art, Gift of AXA Equitable, 2012. The commission marked a significant moment in international modernism, because the great Mexican muralist, José Clemente Orozco, was also commissioned to paint a mural in the New School at the same time. In fact, the two artists worked on their projects concurrently. In 1984, AXA Equitable purchased and restored the mural. It hung in the lobby of the AXA Equitable Tower at 1290 Sixth Avenue in New York City. In December 2012, AXA donated the work of art to the Metropolitan Museum of Art. Thomas Hart Benton, Changing the West, one of the ten panels in the mural “America Today”. Mural cycle consisting of ten panels. Egg tempera with oil glazing over Permalba on a gesso ground on linen mounted to wood panels with a honeycomb interior. The Metropolitan Museum of Art, Gift of AXA Equitable, 2012. In the current exhibition at the Metropolitan Museum of Art, the ten-panel mural is featured in a space that recreates the boardroom in which it originally hung at the New School. Also included in the exhibition are Benton’s studies for the mural, including character studies in pencil and compositional studies in painting. The museum has provided an additional gallery devoted to works from its collection that relate to Benton’s mural. This gallery includes Jackson Pollock’s Pasiphaé (1943). Pollock was Benton’s student at this time and served as a model for his teacher’s mural. The exhibition demonstrates how this monumental work marked a turning point in Benton’s career as a painter, elevating his stature among his peers and critics. It is a bold work of art that stands midway between the artist’s early experiments in abstraction, signs of which are still evident in the mural, and the expressive figurative style for which he is best known today.